On July the 27th I went down to Christchurch for the South Island Chess Championship and and the South Island Rapid Championship at the Canterbury Chess Club. The events were 2 games a day for 4 days (Wednesday to Saturday) for the Champs and then 6 games on the Sunday for the rapid. I flew down first thing on Wednesday for round 1 at 9:30am. It had snowed in Christchurch over the weekend and the Monday so there was a light layer of snow on the ground coming in. Since Christchurch rarely receives snow it had caused some disruption including cancelled flights earlier in the week. However my flight made it in okay and the weather was sunny although a little chilly for my stay. The club is in a light industrial area in the centre-west of Christchurch that has seen little damage from the recent earthquakes. While there were a few cracked buildings, damaged chimneys and other minor mess the area was in fact busier due to businesses from damaged areas moving their while restaurants that were open were busy due to those in the city being closed. The Tournament had 25 entries with The top being Steven Lukey ( NZCF rating 2332, rank 11th) and John MacDonald ( Rating 2114, rank 48th) being the top ranks with me being ranked 17th in the field on 1699. Games were 90 Minutes plus 30 seconds a move and held at around 9:30 and 3pm each day. The opening was a fairly standard c3 Sicilian with Ross making things up a little as he went so I kept a small advantage for the first 20 moves. At that point Ross made a mistake and allowed me to win the exchange ( a rook for a bishop) which solidified my advantage. However he did have 2 bishops so I did not feel my advantage was decisive especially against somebody rated 300 points higher than me so I offered a draw on move 32 which he accepted. Rd 3- White to play 13. d5? Arie is an older player playing in his 55th(!) Canterbury Championship (which the SI Champs acts as). The opening was a Petroff with 5. Qe2 and white retained an advantage coming out of the opening. I started to get ahead around move 14 before blundering a pawn on move 15. I then had to defend for around 10 moves before we swapped down to a rook and a bishop each by move 29. A further swap was down to a bishop and 6 pawns (him) vs a bishop and 4 pawns (me) but we had opposite colour bishops so I though I had a chance to draw. We eventually had pawns racing down opposites of the board with him sacrificing his bishop to stop mine and me probably have to sacrifice mine soon (which probably still wouldn’t have stopped him). However he lost track of time on his clock and it ran out giving me the win. Dan played a Scandinavian with “2. Nf6” which I expected and had practised a little for, although he did a different variation on move 5 than I’d expected I have looked at the one he did so had a rough idea what to play. On move 9 I was the equivalent of a point ahead but I soon wandered a little as the middle game kicked in. 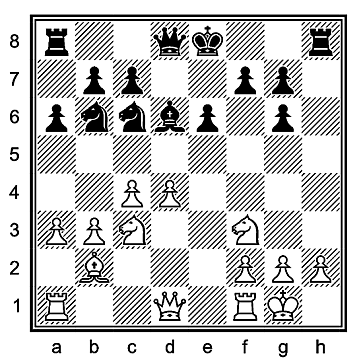 However on move 13 I made a blunder (see diagram) which allowed a check on h2 and a strong attack from black. By the computer’s estimate I was the equivalent of 3 pawns down. However I managed to defend well and black didn’t press his advantage well until we got to the position (see diagram 2) after 24. ..Nc6. My move dxc6! wins the game since it puts me a piece up since if black tries to take my queen then I take both his rooks and queen my pawn on b8. Blacks reply ( Rxe1 26. cxb7 Kxb7 27. Qxd8 Rxa1 28. Bxa1 ) left me a bishop up and an active queen which I used to pick off black’s pawns and eventually checkmate (although I missed a few earlier mating chances). So after day 1 I have 1.5/2 against 2 higher rated opponents and was pretty happy. I used to play against Hamish when we were at school. I gave up chess but he kept playing and last year came 1st equal in this tournament. The opening was a fairly standard Slav with an advantage to white after a let my position get a little cramped. Around move 19 I turned the tables a little and pushed a bishop and two Knights against white’s queen nad got ahead by 2 pawns. I was however short on time and offered a draw instead of risking going for the win. With 3 points out of 4 I was actually playing on board 2 for round 5, however 3rd ranked Quintin Johnson was a much harder opponent. Agsin I had a slav opening but miscalcuated a couple of moves and got myself in trouble by move 15. White build on his lead and overpowered me with his attack. The opening was a c3 Sicilian with g6. Black had a strong bishop down g7->a1 and after he swapped his white bisop for my f3 Knight and I made some lazy moves he captured both my centre pawns. I for one back at the expense of swapping a lot of material until we had just a knight, a rook & two pawns on each side plus he had a central passed pawn. 20 moves of manoeuvring later ( a 3 refusals of my offers for a draw ) . He unexpectantly swapped off all the pieces, made an inaccurate move and gave me a winning endgame. I was now on 4 points out of 6 which I was very happy with given then higher ratings of all my opponents. 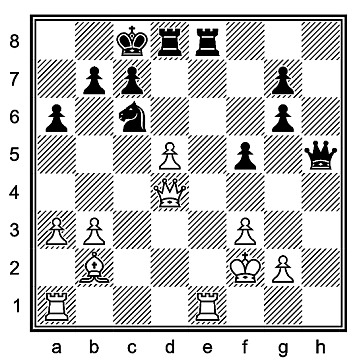 White unexpectedly played the Bishops opening ( 1. e4 e5 2. Nc4 ) and I played it completely wrong to leave me down a full pawn and in a cramped position my move 10. A strong attacked followed and I risigned on move 40. I pulled out a sideline against the Alekhine’s defense which my opponent wasn’t familar with so he was on the back foot after the opening. I didn’t managment to convert my lead but was still a little ahead before he made a mistake and I gained a pawns and an attack. I missed the best continuation however and settled for being 2 pawns up and swapping queens. Some bad play by both sides followed (in timetrouble) until I eventually won. I ended up with 4th equal with 5 points out of 8. However since all my opponents had a higher rating than me this was much higher than my expected score of around 2 so I will gain several rating points from the tournament.